It's no secret that crop producers have a love hate relationship with manure. On one hand even the most skeptical know it's an asset. It's a natural product that applied properly can help boost crop productivity and enhance soil tilth by improving structure and biological activity. It can increase soil aeration, organic material and water holding capacity; reduce erosion; provide micro and macronutrients; minimize environmental risk associated with nutrient loss; and offset fertilizer costs. Handled improperly it's a liability. Its use in crop production is a visible and often volatile link of concern with neighbors and the general public. At the farm level, besides being somewhat of a pain in the neck to handle, it can result in nutrient accumulation in the soil reducing the economic benefit of the application. It can also increase risk of nutrient loss to the environment and negatively impact crop production. For all the interest and concern that manure has generated recently there hasn't been much new in terms of developments in solid manure spreaders the past few years, says Jenn Neden of Alberta Agriculture and Rural Development (ARD) who has worked with producers to implement nutrient management plans. Until recently. Spreaders with new style vertical beaters were introduced and farmers began asking how good these things were and how they would fit into a manure management system. Now those producers have some help in making their decision. A just completed study at the AgTech Centre in Lethbridge, Alta. 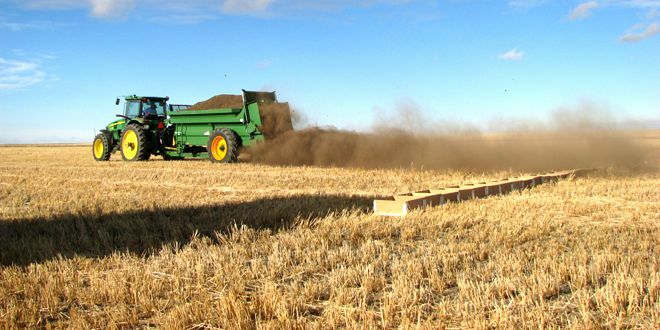 compared types and models of solid manure spreaders on feedlot manure and compost to evaluate the spread pattern and material distribution of different manure beaters to see how each worked with fresh and composted material. "It clearly showed that method of application is a key to getting the most from manure or compost application," says Virginia Nelson, an engineer with the AgTech Centre who worked on the research team. 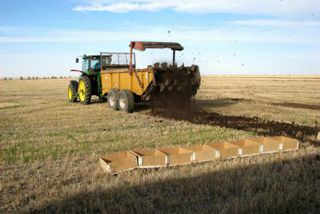 Many producers will know the fundamentals of solid manure spreaders. Basically they fall into two categories: side discharge and rear discharge. Side discharge have high capital cost, slow uploading rate, more complicated design and significantly greater power requirements. Rear discharge models have either horizontal beaters or vertical beaters. Horizontal beaters are the most common type. They typically have a narrow spread width and do not handle some material well. They can also be poor at breaking up lumps. One type of horizontal spreader has lazy Susan style spinning disks below the beater bars. That improved distribution. The new vertical beater bar spreaders have a wide spread width, fast unloading rate and are good at breaking up material. However, they are more complicated systems and have higher power requirements than horizontal systems. The pattern on the field is affected by the distribution system as well as the manure or compost characteristics, says Nelson. A uniform spread pattern means the manure and therefore the nutrients are evenly spread on the field. With a non-uniform pattern manure and its nutrients are not spread evenly. That can affect crop germination and can cause crop burn or nutrient deficiency. The research tested feedlot manure and compost. Spreaders were not set to spread identical rates. Instead each spreader tested product applied at the manufacturer's recommendations. High and low application rates were chosen for each spreader. "We learned clearly that vertical beaters have a wider spread," says Neden. "That means fewer trips over the field. Older horizontal style models essentially dump the manure out of the back. So the spread width is about 6 ft. Wider spread means fewer trips over the field, so that means fuel saving. "It also means less soil compaction. Many times manure is applied in spring or fall and the chances of getting compaction are certainly higher this time of year with this big equipment." All of this is much better suited to reduced or no-till systems, says Neden. Because vertical beaters chop the manure up into such fine pieces people don't have to work so hard to incorporate it into the soil. Older spreader models essentially just drop it out of the back so people will need to break up those clumps before they seed with a technique like a light harrowing or disking. One of the biggest factors in manure management in crop systems is the environmental factor. Phosphorus loading of water supplies is a major issue for all of agriculture and in particular related to manure management. "Better spread patterns give producers more control so that they can apply manure or compost safely to their field," says Neden. Better spread patterns mean lower rates with compost which has a concentrated nutrient profile. The first phase evaluated the technology. A second phase will compare models. Producers will be able to access a new factsheet from ARD that should be available early in the new year says Nelson. There are also a good selection of YouTube videos available says Neden. Just search "vertical manure beaters."